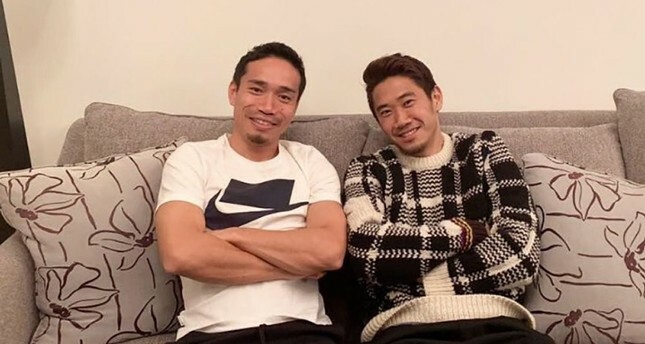 Galatasaray defender Yuto Nagatomo, left, and Beşiktaş midfielder Shinji Kagawa pose for photo after dinner at former's house in Istanbul, Feb. 5, 2019. Japanese football star Shinji Kagawa's arrival to Super League giant Beşiktaş has drawn significant attention both in Turkey and the player's native Japan. Kagawa enjoyed a dream debut for the Black Eagles last weekend as he scored a brace — both stunners from outside the box — just three minutes after coming on as a substitution. The 29-year-old's first match and presentation were widely covered by the Japanese media. Upon his transfer to Turkey, Kagawa joined his Japan teammate Yuto Nagatomo, who plays for another Istanbul powerhouse Galatasaray. Nagatomo hosted Kagawa on Tuesday for a dinner in his Istanbul home. Following the dinner Kagawa said he would like to return the favor after winning the Galatasaray-Beşiktaş derby, which is scheduled for early May. On Wednesday, representatives of an agency that sells football broadcasts from abroad to the Japanese market made an unexpected offer to beIN SPORTS, which owns the broadcasting rights of the Super League, and the Turkish Football Federation (TFF). Beşiktaş signed Kagawa on loan from Borussia Dortmund until the end of the season.